Furry Friend Friday With Isabelle! It’s that time of the week again! Today we got to chat with Isabelle, isn’t she just adorable? 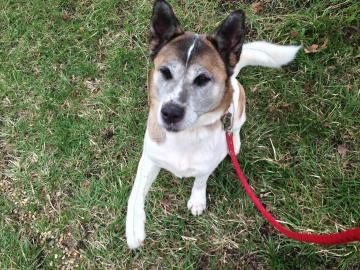 This pretty gal is a 7 year-old Akita mix up for adoption at the Lowell Humane Society. We were almost as excited as she was for this Furry Friend Friday interview, and she’s more than ready to find her forever family! So Isabelle, what’s your favorite way to spend the day? Well I’m a pretty relaxed girl, I love being around my people most of all. I really like to snuggle and get nice and comfy. I’m not sure if you know but I came here as a stray, and that wasn’t exactly an easy way to live, so now I’m ready to just sit back and enjoy the good life. I have my moments, I’ve slowed down a bit as I’ve gotten older but I still enjoy being playful sometimes. I also enjoy Kong toys, you know the ones that you can fill with yummy stuff like peanut butter? Those are great and keep me entertained for a while. Nope, being out on the streets made me pretty tough, plus Akita’s aren’t known for being timid. There isn’t much that scares me, I think I’d make a great watch dog and best friend all in one! Well I love people and I get along with all of them, but because of my size it’s recommended that I go to a home with older children. I also love other dogs, especially big ones like me! So if you already have a furry friend I’m sure we’d get along, as long as it’s not a cat or other small animal, I’m not too fond of them. As I said I can be playful at times and enjoy going on walks, but I’m really looking for a place where I can mainly relax and snuggle all day, a retirement home if you will. I really hope to find a family soon, and I love the people here but am ready to find a permanent home! Isabelle, why do you think pet insurance is a good thing for all pet parents to consider? I saw a lot of things in my time, I’ve had a home, lived as a stray, and now I’m here at the shelter, and in that time I’ve met a lot of other pets. Some of these pets have injured themselves in accidents, or gotten sick unexpectedly, much like you humans. Just like your doctor’s bills, our vet bills can really add up, but unfortunately we can’t pay for them, that’s where you come in. Pet insurance seems like a great way to make sure you don’t get stuck with a huge bill that will break the bank. Isabelle has brains to back up her cute looks! We wish we could adopt her ourselves, but we know once she finds the right family she’ll be happier than ever. We’re sure that you’ll be happier than ever too if you make sure your furry friend is protected. Call one of our agents today for a free pet insurance quote and find out how affordable it is to protect your furry friend!